Last week I talked about a memorable meal and I am going to touch on that theme again this week. This time I am going to go back even further to a trip to Perth when I was maybe 19 years old. Yes, that far back! This time my trip down memory lane takes me back to a day when I went to Fremantle. I happened to be in Perth at the same time as a friend from work so we met up and went down to Freo and did touristy things. It was getting to the point of being past lunch time when we decided that we were hungry and we decided to eat at a somewhat kitschy restaurant. I chose garlic prawns which was served with white rice and oh my goodness, so good, When I think back it was probably a pretty simple version of garlic prawns. There seemed to be only prawns and lots and lots of finely chopped garlic. There must have been something else in there to aid the flavour but I have no idea what that would have been. Unlike the dish I mentioned last week, after a couple of failed attempts a long time to ago to find another garlic prawns dish that I like I have stopped trying garlic prawns if I go out for dinner. I seem to be a bit obsessed with eating seafood at the moment. My go to weekday dinner at the moment is pre-packaged steamed fish in a Thai coconut sauce with brown rice and baby broccoli. I am using the precooked rice so not only does this meal taste good but it also takes approximately 5 minutes to cook. I had this a couple of times this week. Then yesterday I had prawn pad see ew from the Thai restaurant near work yesterday and I bought sardines to have for breakfast tomorrow. 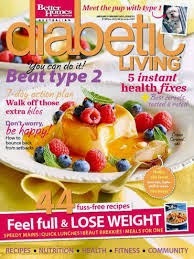 And then there was the new recipe I tried tonight from the current Diabetic Living magazine. There are a number of recipes I am keen to try in the current magazine but as soon as I saw it I knew this would be the first recipe I would try. There are actually three components to this meal, but the hardest thing really was chopping the vegetables for the sauce. Other than that, it is pretty simple really. And I have to say the salad was a winner! I don't usually do the dressing thing but this was quick and simple and tasty. To make spinach, tomato and bocconcini salad put beans, spinach, capsicum, tomato, onion and bocconcini in a large bowl. Toss to combine. Whisk vinegar and oil in a small bowl. Season with pepper and set aside. 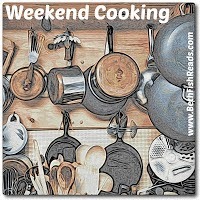 Heat oil and margarine in a large non-stick frying pan over a medium high heat until foaming. Add garlic and cook for 30 seconds. Add the prawns and cook, turning often, for 2 minutes or until almost cooked. *For a variation, you can replace the beans with sugar snap peas or snow peas, and the bocconcini with low-fat ricotta. Heat oil in a large saucepan over a medium heat. Add onion, carrot, capsicum and garlic. Cook uncovered, stirring occasionally, for 8 minutes or until onion softens. Add tomato. Increase heat to high. Cover and bring to a simmer. Reduce heat to medium and cook, covered, for 30 minutes or until tomato breaks down and forms a sauce. Set aside for 10 minutes to cool slightly. Transfer sauce to a food processor and process until smooth. Return to pan. Use immediately or either freeze or store in sterilised jars. I think you are probably going to hear more about the sauce next week! Oh wow. This whole meal looks awesome. The salad says summer! I'm going to remember it for when I can get the tomatoes fresh from the farmers market. I could see making that sauce in July or August and popping it into the freezer for all-year use. Yum. What a pretty plate of food! I got hooked on "shrimp scampi" when I was a teenager and always ordered it when I ate out. When I was engaged to be married, I discovered my husband could make it at home! Which was wonderful. I also found out how simple the recipe actually was (basically butter, garlic, white wine, and lemon) and have even made it myself since those long ago days. I loved Fremantle. I do a garlic prawn sautéed in butter with garlic and chili flakes. Loving the look of this meal, summery and healthy! We are in the dead of winter here but I sure look forwrD to some pTio meals where I can eat shrimps. Outside! After all the rich foods we ate over the holidays, a seafood diet sounds good. This looks delicious! I've never had a garlic prawn dish with a tomato-based sauce. Will have to give this one a try. Oh yum! 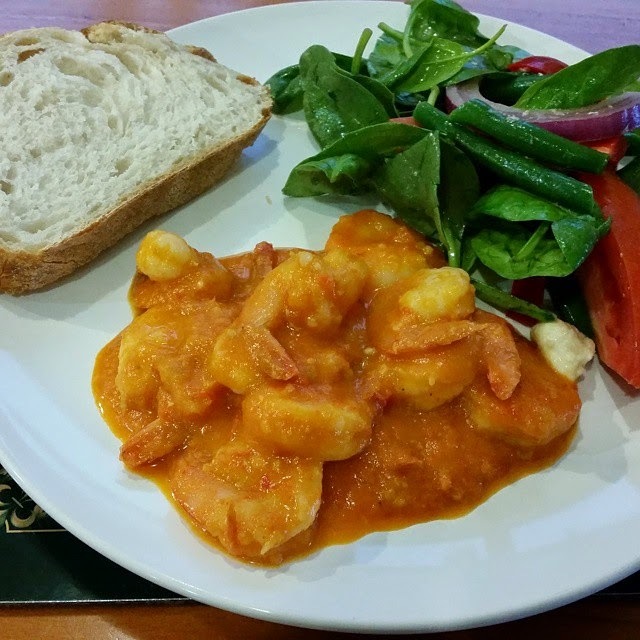 Food nostalgia is such a funny thing - the best garlic prawns I ever had were in a Spanish restaurant in the basement of a building in Chesser Street in Adelaide called Los Amigos. I was only a child, and the restaurant probably closed nearly 40 years ago (! ), but I can still remember how good they were. Mmmm! I grew up on the coast and I love seafood in all iterations, but I have so many friends now with allergies that I don't really attempt it at home. There is a dish I always order at my local Thai restaurant, though - prawns and butternut squash in a red curry sauce. SO GOOD! I'm sure this garlic prawn dish is fabulous. Omnomnomnom, the garlic prawns look amazing! Actually, the whole meal looks amazing! I don't eat seafood but your salad looks amazing!